Buzzards Bay is an important stopover location for overwintering marine wildlife, most notably seals of the Northeast region. 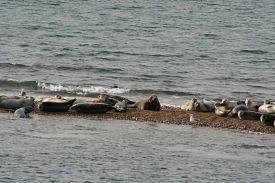 At “Gull Island”, a small sandbar situated along the Elizabeth Island chain between Cuttyhunk and Penikese, seals haul-out at low tide. Harbor, Grey, and Harp seals may be viewed, and Great Cormorants are an abundant waterbird at this stop. Waterfowl such as eiders, scoters, and loons may also be seen on the boat ride out. After seal-viewing, the boat docks at Cuttyhunk for lunch and an opportunity to set foot on the island. At this point, you’re free to venture through town to the lookout to gain a feel for the unique landscape and enjoy a panoramic view of surrounding waters. For bird enthusiasts, follow Lloyd Center naturalist Jamie Bogart for bird-watching in the vicinity of Cuttyhunk Pond, where additional bird species may be seen. In addition to learning about some unique wildlife, you’ll leave with more knowledge about Buzzards Bay, and a new appreciation for its surrounding landscape. Pre-register online, or call 508-990-0505 x10. Pre-registration is required by Thursday, March 15th by 4:00 p.m. If you have specific questions regarding the program, please call Jamie at 508-990-0505 x23, or email jbogart@lloydcenter.org. Please see www.cuttyhunkferrycompany.com for further background about the company with which we are partnering for this outing. Price: Members $43 Non-members $45 Children $20 Price includes lunch served on boat and packet of background materials. Additional items may be purchased (cash) on the vessel, and on the island. Except for weather cancellation or personal reasons (illness, injury, etc), seal watch tickets are non-refundable.